You probably won't get it semi-sweet chocolate brown, but you can still get a great taste and get it this brown. 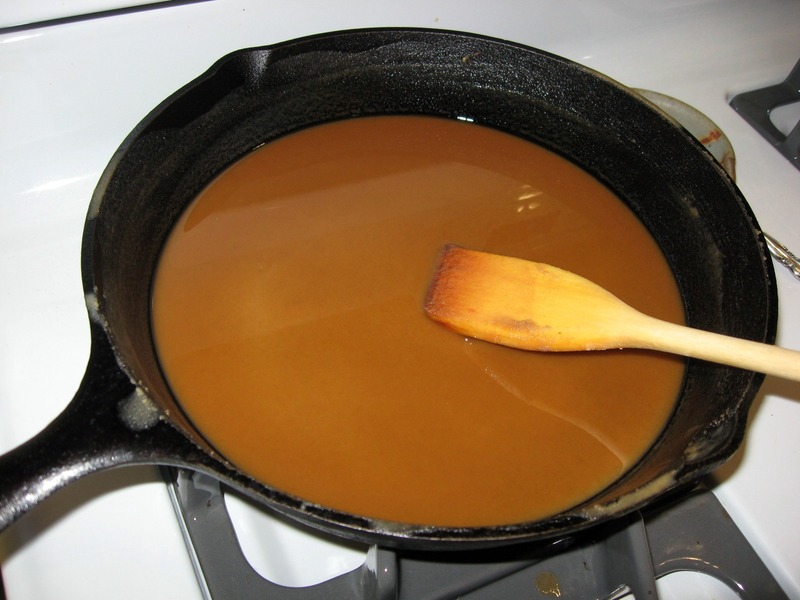 Anyone who has cooked from Cajun recipes knows that many of them start with "First you make a roux." I don't know how many recipes I have written in my own hand dictating what my grandmother was telling me in person or on the phone that begin with "First you make a roux." 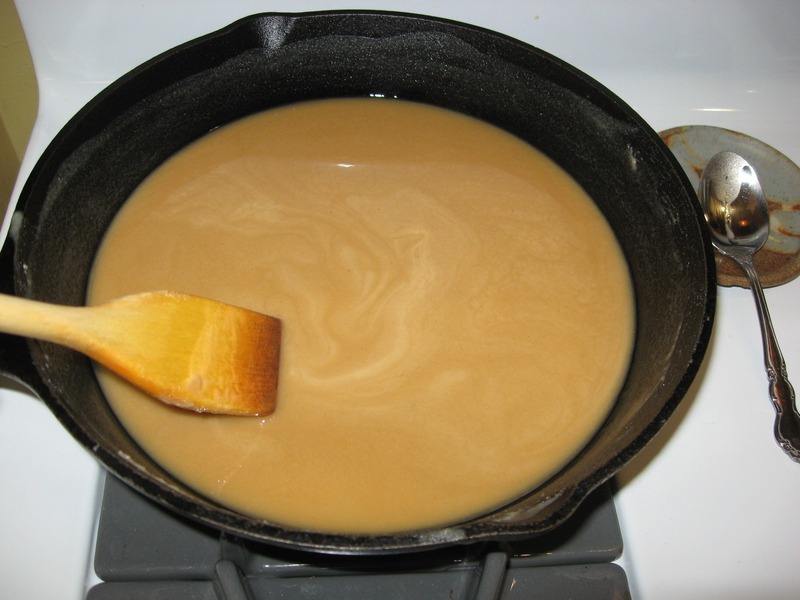 There are different types of roux for different uses. This recipe is being made for a gumbo. 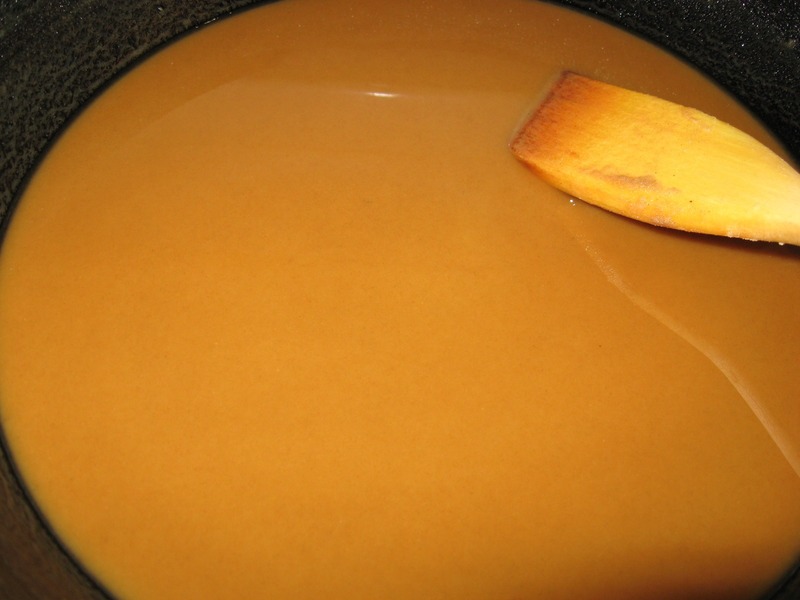 There are also different fats and oils used in roux, depending on preference and what it will be used for. Many of my grandmother's recipes call for "oleo." I prefer to use butter for nearly everything, and like to make roux with butter. 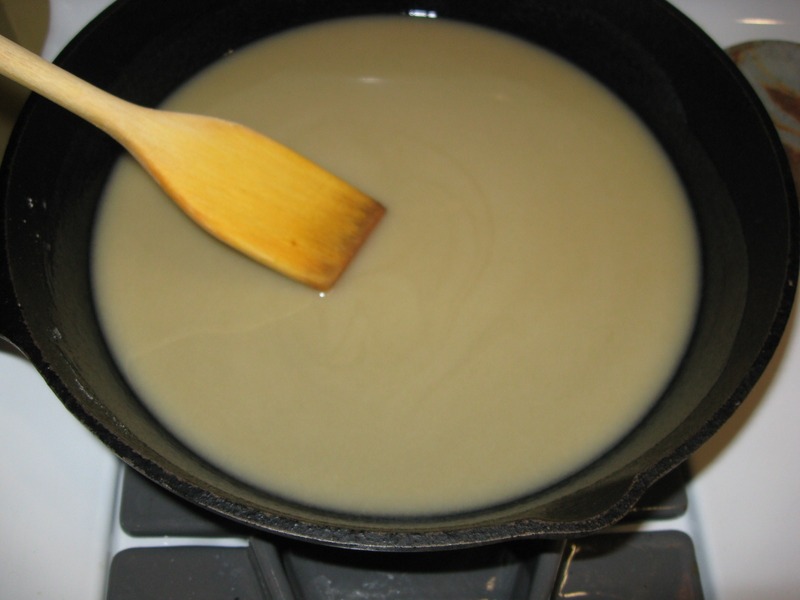 You've got that milk fat in butter, though, and that can present a problem when you're really trying to brown the roux unless you clarify the butter first. Before we went gluten-free, I made roux without fear. I could get it really brown and it smelled fantastic. Then I was introduced to Kary's Roux and Kary's Dry Roux and I got lazy. (Any chance Kary's will ever make a GF version??) I made gumbo more often because I didn't have the work of the roux. 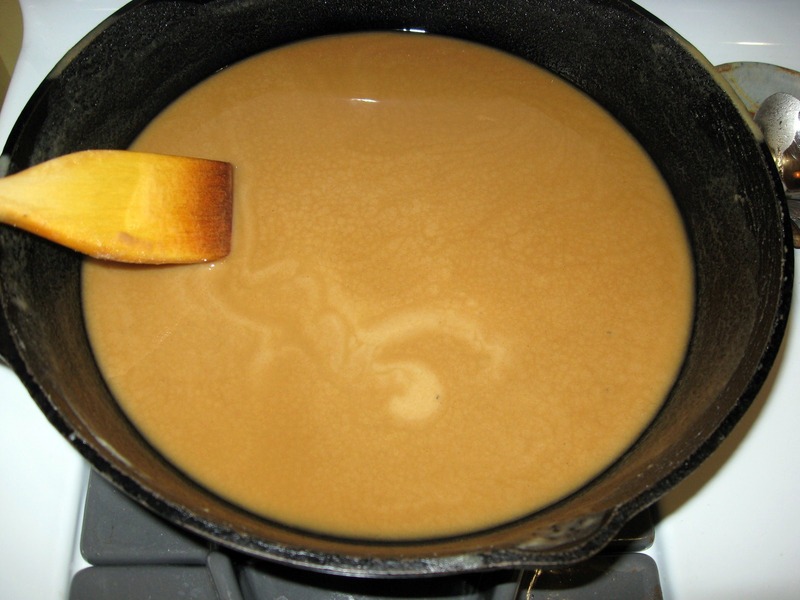 When we went gluten-free, it took me a full year to attempt making a gluten-free roux. I was scared, but I wanted gumbo for New Year's Eve so I braved it, and it was good. You aren't going to get the exact same results with gluten-free roux as you will using all-purpose wheat flour. It's not going to brown as much as it did pre-GF, and it won't be quite the same texture. But you can still get that great nutty smell and a good taste. Don't be afraid of the work -- and it is work -- it's always worth it! 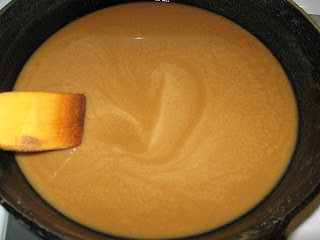 I'll start this by saying that I may have been able to get this roux to brown a little more. I'd been working on it for an hour and 15 minutes, but the gas company had to come check our lines and was going to have to turn the gas off and therefore my flame would be gone so I had to get this done before they turned it off. Normally you would use equal parts fat/oil and flour. The gluten-free flours don't swell as much, though, so as in the case of these photos where I did use almost equal parts oil and flour (used a little more flour), there was too much oil left at the end. It wasn't hard, though, to tilt the pan a little and spoon out some excess. I have also started experimenting with weight of flour vs. by the cup, so I had a little more than the oil in flour. I like to use brown rice flour for roux because it's already a little brown, which helps, but I think I may add a little sweet rice flour to the combination next time around. I like to use a cast iron skillet for roux. If you don't have one, use a heavy pan. 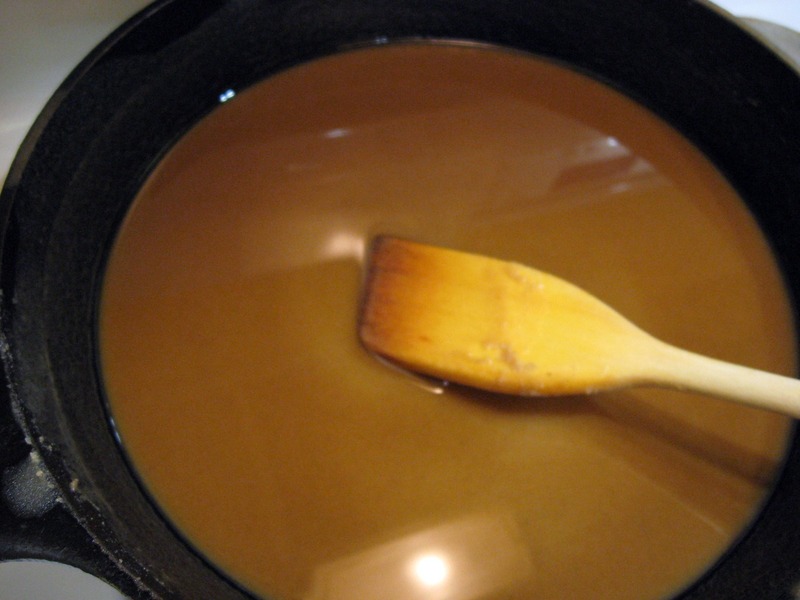 Also, a roux paddle or flat wooden utensil is important because you're able to scrape every little bit from the edges as you stir. Heat your skillet and oil, then add your flour and blend well. Continue to cook on medium-low heat while stirring and scraping constantly. 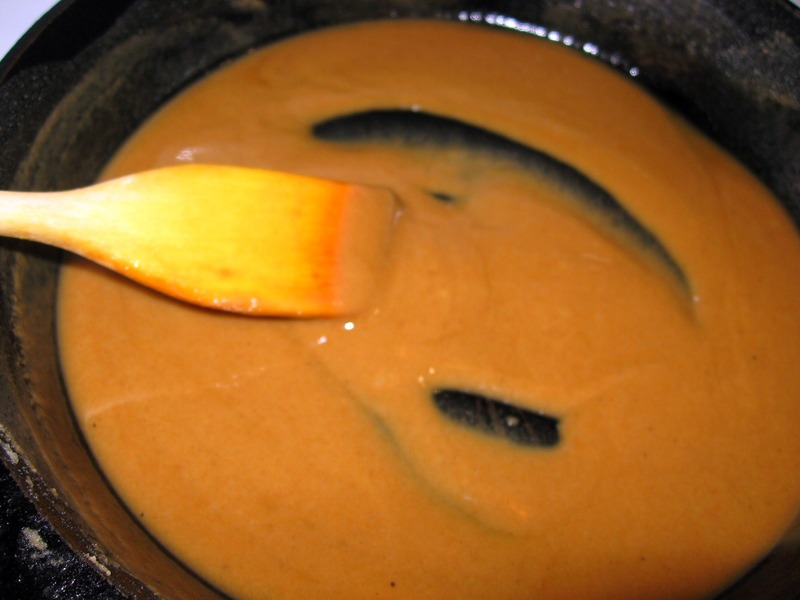 You won't be able to leave the stove when you cook roux. Don't answer the door or the telephone. Don't get something to eat for your 4-year-old who is home sick (it was probably not the best time for me to make this, but in all fairness I did give her a snack and cup of water before starting the roux). Some of these photos will be blurry because I wasn't taking the time to really focus on them. Continue to cook, stirring, stirring and scraping. It will gradually get darker and darker. Be careful not to let it splatter on you when you stir. It will give you a nasty burn. And then you'll probably burn the roux because you'll be taking care of said burn. Now you're probably going to want to turn the heat down to the lowest flame you can and continue cooking, stirring, stirring, scraping. Have patience, and keep it up. It should be smelling so good that when your significant other walks into the house they think you are cooking something fabulous. And you are. Eventually, you'll get to a point where you know it's time to turn the heat off. In this case I turned it off about an hour and 15 minutes later. I could have kept going a little longer, but like I said above, the gas company was coming and I wanted time to deal with anything they might be throwing my way. You don't want to burn the roux because if you do, it will smell bad, taste horrible and all that work will be for nothing. That's why you can't ever leave the stove. If you are cooking with a cast iron skillet, you'll want to turn the heat off before you get to that point because the skillet retains so much heat. It will continue to cook after the heat is turned off. Keep stirring after you've turned the heat off. If you plan to go ahead with your gumbo at this point, follow the recipe here. If not, you can stop here and let it cool, while you continue to stir until it is much cooler, then you can transfer it to an airtight container and refrigerate for use later in the week or put it in the freezer. When you reheat it, just stir it really well and continue on with the gumbo. If you feel like you have too much oil in it, like I did as noted above, you can easily tilt the pan a little and spoon some of it out. Just make sure you don't get it on you. I too am a Cajun girl and know how hard it is to eat healthy Cajun food. I found it very interesting that you can make a gluten-free roux. It seems that you try to eat healthy, so I would like to ask you to read about Canola oil. It is not very healthy and I think there are other products that would serve you and your family better. Is there a difference between cold-pressed canola oil and the regular stuff? I have become a big fan of cold-pressed canola oil as of late, it's super nutty and so long as you keep the temp low, the roux it makes is phenomenal. Will have to try that, it sounds great. Thank you! Yet the hydrogenated fats are still in the canola oils. Use nut oils. Which nut oil do you like to use the most? I have only experimented a little with nut oils. Any good Cajun girl knows that the bet nut oil is PECAN! I used the Namaste flour today while making roux with equal parts of flour and oil. It was the first time I attempted gluten-free roux. It turned out great and no one was able to taste the difference. I like my roux really dark and by the time I add the vegetables, it looks like really dark chocolate. I then add it to the chicken broth from boiling the chicken and it lightens it up a little but not much. I have made it without mixng the vegetables in the roux as well, but I have found that when the roux is really hot, it sautee's the yellow and green onions, bell pepers and celery really well while giving it more flavor. 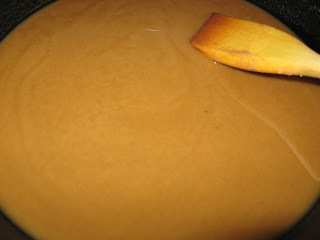 It also cuts some of the bitterness of the roux without having to add more water to soften the taste. Thanks for letting us know the Namaste flour worked really well! Anyway here is something I recently learned about that I think might thrill you all--Making roux in the oven! I love gumbo but making the roux was so darned difficult and time consuming that I didn't make it very often. Then I read about making roux in the oven. I thought there would be no way it would be any good or else everyone would be doing it but one day I finally tried it and by golly it was just as good as doing it on the stove top! It is so easy it is almost like cheating! 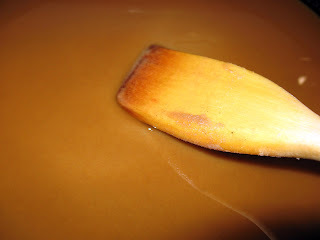 And since I like dark roux I found I had more control over it in the oven. I like using olive oil in the roux--you would be surprised how good it tastes. As opposed to having to stand over the hot stove stirring roux constantly when you make it in the oven you only need to stir it occasionally : ) Directions for making roux in the oven can be found online. Not sure if you still look here based on the spam comments above, but if you do, THANK YOU. My family went GF this year due to my son's confirmed intolerance and my husband's suspected intolerance (haven't tested him yet). We've wondered how doing a GF roux would work. And we are also almost done with a kitchen remodel than includes switching to a gas stove. Your post has me fired up for trying it as one of my first ventures in my new kitchen. Thanks. Love your blog. Being from South Louisiana I understand completely your method, including not leaving that stove for anything. I miss my roux since going GF less than a year ago. thanks for this-I know it will be great. "your way cuisines" sells jarred GF roux. Hi. 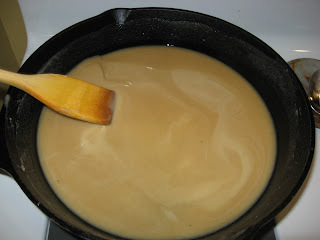 I just made gluten free roux following your suggestions and using King Arthur gluten free flour. I used 1 c of flour and 3/4 c oil. I found that it never got dark enough and was way too wet. It never got thick like making roux with regular flour. Suggestions? Thanks. I'm sorry it didn't work out! I haven't tried the King Arthur flour for this, so I'm not sure. I would think that the extra starch in that would help thicken it up, but maybe not. 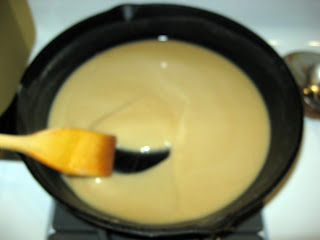 I have found that when I have tried to use tapioca starch instead of corn starch in pudding-type recipes, I have to be more careful with not over-stirring, or the thickness will vanish. Perhaps a blend with tapioca starch acts the same way? Gluten-free flours just aren't going to act like regular flour in most recipes, but they should get dark enough in the roux. I find it takes a loooong time, though. I hope you find luck in your next try! I'm sure you could try it, but as we eat gluten-free we don't use wheat flour. Thank you so much for posting! I've been GFree for 7 years now and just started to think about making Cajun food again. I'd tried to made a roux once with rice flour but it gummed up and just stayed hard. (sad). I'm going to try this method-am all excited now!